Text and Photos by Eli Wasserman. Attending an ANC training in Karwasa, Musanze. Photo by Maggie Andresen. My name is Eli Wasserman and I am a rising Junior attending Brandeis University and majoring in International and Global Studies and Health, Science, Society, and Policy. This summer, I had the privilege of working with GHI’s Rwanda-based office as one of two data and communications interns. As my internship comes to a close this week, I wanted to share my reflections on some of GHI’s programs and practices that inspire me to continue to pursue a career in global health development. Innovative new programming has allowed GHI to impact new communities with targeted interventions that are unique from its core work supporting mothers of malnourished children across Rwanda. In 2016, GHI pioneered an Antenatal Care Program, developed to train pregnant women in topics related to maternal health and early child care, mirroring the healthcare priorities of the government of Rwanda. The program has reached thousands of women in Gasabo and Musanze districts, and will reach even more women in the coming season as it runs side-by-side to the Musanze Health Center Program. Additionally, GHI held their first Training of Trainers session (ToT) this June, where they brought Rwandan leaders from nonprofit and private organizations from across the country to GHI’s Ndera headquarters to learn essential topics in health and nutrition to teach their communities how to lead healthy lives. The inaugural ToT ran over two days this June, and another ToT training in agriculture is slated to run this winter due to the success of the first event. Another incredible part of GHI is that they encourage their participants to pass on their newly acquired knowledge in health and agriculture topics to members of their communities who otherwise would not have access to GHI education. This is one of the ways the reach and impact of GHI extends beyond the health centers they work in and participants they train. In addition to the exciting additions to GHI programing, there are many small steps the organization takes in order to maintain their mission effectively. One of the things I admire about the GHI office is its self-sufficiency. 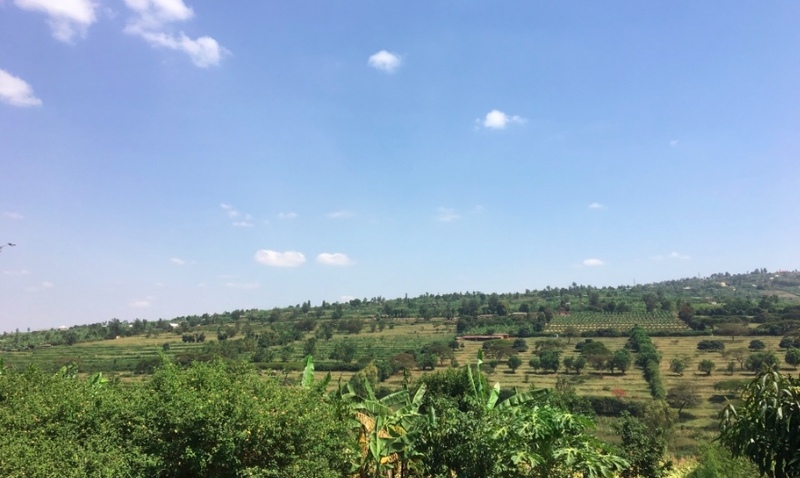 GHI is headquartered on a five-acre farm on the outskirts of Kigali that serves three purposes. First, the crops grown on the farm provide the seeds for the home garden package given to all the families who complete GHI’s core three-month Health Center Program. Second, most of the food made for our daily community lunch is produced on the farm. Third, the surplus harvest is sold in local markets, and the proceeds are reinvested into maintaining the farm. These practices play into why I believe GHI is such a credible organization. They practice their teachings holistically on a daily basis, encouraging everyone involved in GHI to live up to its mission. View from a village where I shadowed the health team in an ANC home visit. My work with GHI has focused primarily around developing a data repository for the different monitoring and evaluation indicators GHI uses. Through this project, I have helped the organization work towards making accessing data more efficient, and I am proud of the work I have contributed. My co-intern and I were also in charge of authoring a weekly email updating subscribers about the most recent news in global nutrition and agriculture news and research. I loved being able to interact directly with GHI’s supporters, and I look forward to seeing more weekly digest emails from GHI in the future. I was also involved in a number of amazing projects not included in my initial job description, such as supporting the Training of Trainers program, and helping orient different visitors who came to the farm. Through my participation in all these projects I feel I have gotten a well-rounded view of how GHI operates. ANC Training in Karwasa, Musanze. Looking back at my experience at Gardens for Health International, I have learned so much more about a field I am already passionate about. For someone trying to pursue a similar internship, I would advise they take full advantage of their time in the field, because opportunities will not just fall into your lap. I also recommend always asking where you should go, what you should do, and most importantly, how you can help!